The windows operating system comes with its own partitioning software; however, while this is adequate for the simplest of tasks such as Creating, Formatting and Deleting, it severely lacks clout when it comes to doing anything more advanced. Yes it is possible to shrink a partition using Windows' own Disk Management application, but there are severe limitations upon just how much of a reduction you can physically achieve. For this reason it is advantageous to have a third party partitioning application to hand that can help you out of any tight scrapes you get yourself into while performing partitioning tasks. For example, say you accidentally delete a partition. Will Windows Disk Management actually help you recover it? The answer is a resounding No; hence you need a more versatile partitioning application such as EaseUS Partition Master Professional. EaseUS Partition Master Professional displays a clean, uncluttered interface with everything you need to hand and is capable of performing, not only basic tasks such as: Creating, Deleting and Formatting, but also more advanced tasks such as Resizing, Moving, Merging and Undeleting. It also has the capability to check for errors on a partition, using Microsoft's ChkDsk application, perform a surface scan and repair any disk errors. As well as Creating and Resizing partitions, Partition Master Professional includes support for dynamic disks allowing you to copy and resize dynamic volumes; it is also easy to convert dynamic disks. You can also safely merge two adjacent partitions to create a bigger partition without loss of data. Unallocated space can also be securely wiped ensuring any sensitive data is completely erased from your hard drive. EaseUs Partition Master Professional has the capability to defragment the hard drive. However, the defragmentation engine used is that of Microsoft's own defragmentation tool. As such this form of defragmentation leaves a lot to be desired in the sense that there is no visible way of knowing how far the defragmentation tool has progressed. Partition Master Professional comes with three built in wizard, a copy disk wizard, copy partition wizard and a partition recovery wizard. These guide you quickly and effortlessly through the relevant procedure. If you are installing a new hard drive the Copy disk wizard provides an easy way of copying the contents of one hard drive to that of another, thus ensuring that you get a true copy of the disk/partition you are attempting to copy. While creating a partition is relatively easy there is nothing more guaranteed to get you into a sweat than accidentally deleting a partition. Fortunately, Partition Master Professional has a quick and easy partition recovery option. 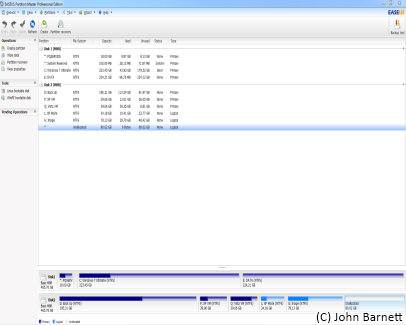 Partition Master will scan your hard drive to see exactly what partitions can be undeleted, thus saving the day. No self-respecting partitioning application is of much use unless you can access it from a pre-windows environment. Partition Master Professional accesses the pre-windows environment with the aid of a bootable disk. 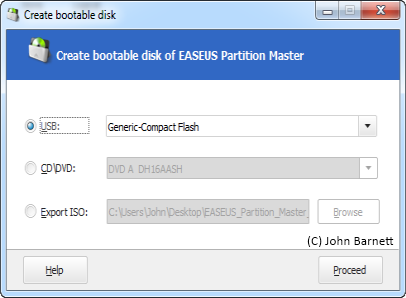 Partition Master Professional supports two types of bootable media, WinPE and Linux. Although both options are made available in the Partition Master window the only one which works, the other option simply directing you to the EaseUS upgrade website, is dependent upon the version of Partition Master you ultimately buy. The lowest priced version having a Linux bootable option while the more expensive has the latest WinPE option. EaseUS Partition Master Professional is up there with some of the best partitioning applications. The application is easy to use whether you are a novice or a professional. The downside, in our opinion is the rather conspicuous Backup Tool button situated at the top right of the Partition Master window. This is somewhat misleading in that Partition Master Professional does not, by default, have any form of backup facility. Indeed the backup tool button is only of any use when you also have the EaseUS Toto Backup Workstation (price £23.96 ($39)) application installed on your system. If you don't have the Toto application installed then the button becomes totally superfluous to requirements. Setting the misleading Backup button aside, EaseUS Partition Master Professional is an excellent partitioning application which is well worth having. We highly recommend it.